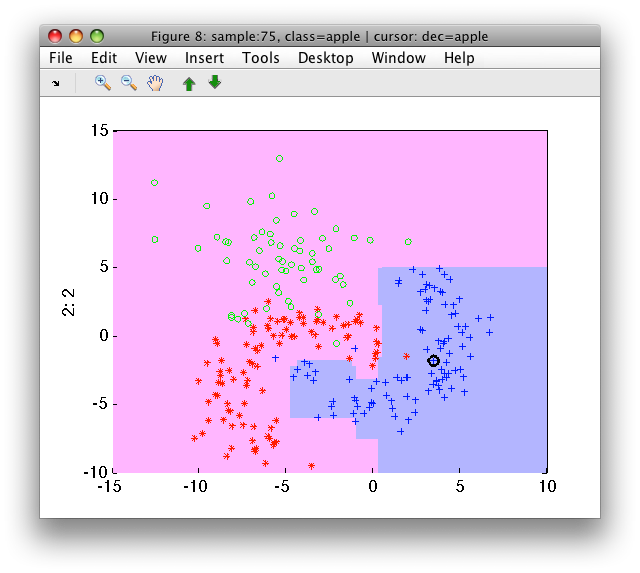 This chapter describes combining multiple classifiers. 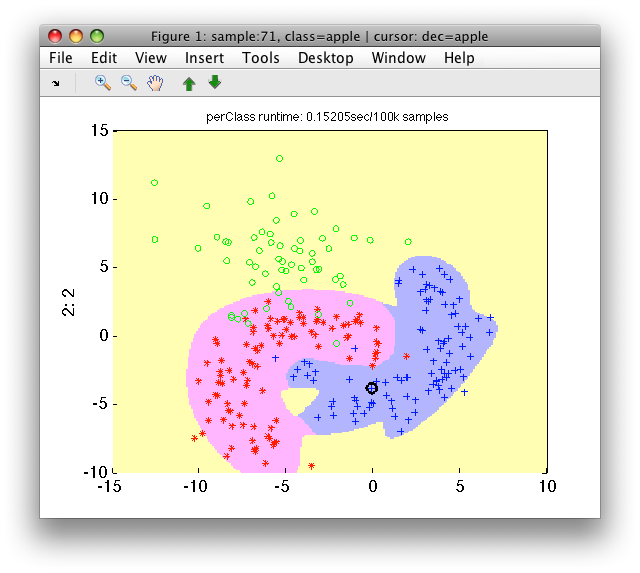 Classifier combining leverages multiple classifiers to improve performance. Combining is known under many other names such as classifier fusion, multiple classifier systems, mixtures of experts etc. 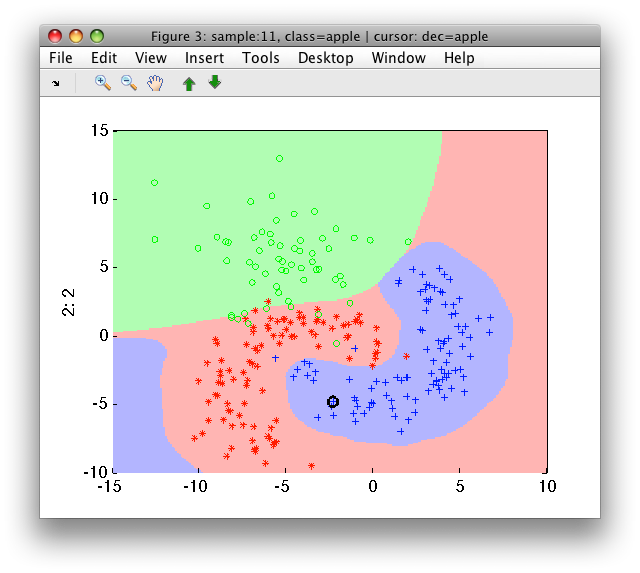 The concept of classifier fusion is quite general. In fact, several perClass classifiers can be considered as compositions of elementary learners. This includes mixtures of Gaussians, decision trees, random forests or neural networks. In the first approach, soft outputs of the base models such as posterior probabilities or distances are combined. In the second, we fuse the crisp decisions. perClass supports two major approaches to soft-output classifier combining, namely fixed and trained combiners. Fixed combiners are rules chosen on the basis of our assumptions on the problem. For example, if we know that classifiers trained on different data representations are independent, we might choose product rule. The second type of classifier combiner is trained. Instead of assuming any fusion strategy, we learn it from examples. Trained combiners simply use per-class outputs of base classifiers as new features. 1 Gaussian model         2x3  full cov.mat. 1 Gaussian model          2x3  full cov.mat. Classifier stacks may be also created from a cell array of pipeline using sdstack command. Fixed combiner is a rule applied to soft-outputs of the base classifiers. For example, we may wish to average-out errors of based classifiers. Therefore, we adopt a mean combination rule. It will create new soft output set with averages of each per-class output over all classifiers. It is important to note that all base classifiers must yield comparable soft outputs. Otherwise, the assumptions the combiner is based on do not hold. In our example above, the first base classifier returns posteriors while the second probability densities. These soft-outputs are not comparable. Note that the first three columns sum to one (posteriors) while the last three do not (densities). 'max' - useful to pick the most sure classifier. Classifiers must be properly trained. Trained combiner is a second-order classifier trained on a data set comprised of soft-outputs of base classifiers. The advantage of trained combiners is that we may use any based classifier models even having incompatible soft outputs. For the second stage classifier, soft-outputs are mere new features. Note, that reuse of all training data for both stages may result in over-fitting of the combiner. Multiple strategies are possible such as validation set approach or stacked generalization (available in perClass via sdstackgen command). Second major approach of classifier fusion is to combine decisions of base classifiers, not their soft outputs. This has a major advantage in allowing us to optimize each of the base learner for the task at hand with ROC analysis. For example, in a defect detection system, we may tune each base classifier not to loose certain type of defect. The sdstack function and horizontal concatenation can be used also on classifiers returning decisions. An alternative crisp combination rule is 'at least' N agree. We build a set of 10 decision trees. Recall, that a sdtree performs a random split inside to get a validation set for pruning. We use this to introduce some variability in our 10 base classifiers. Without variability in the models, there is no benefit on fusion. The 'at least' fusion rule is very useful, for example, in purifying high precision decisions in defect detection applications. Cascading is a form of classifier combining based on decisions. 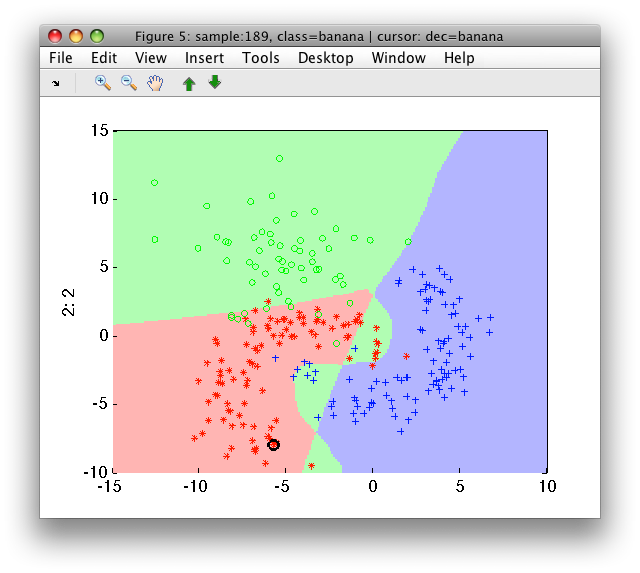 All examples, that are labeled with a specific decision are passed to different classifier. This approach allows us to design multi-stage systems or use best features for each sub-problem. Classifier hierarchy is built with sdcascade command. Let us take an example where we want to build a detector for fruit, followed by classification of specific fruit type. 1 Mixture of Gaussians    2x1  6 components, full cov.mat. We choose the operating point where we do not loose much of precious fruit and save it back into the detector pd by pressing 's' key. We can observe that our 'apple'/'banana' classifier is protected from all directions by the first stage detector.